You can pick up a free Honey Bun cake at Stripes Convenience Stores! If you enjoy shopping at Stripes Convenience stores, you really need to check out the freebie right away. 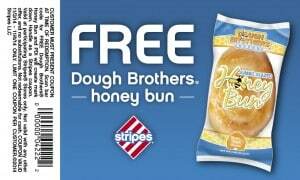 Click here to pick up the coupon for a free Honey Bun cake at your closest Stripes! This coupon is only good today, November 4th. So, hurry up and reserve your delicious freebie now!